Despite having a child of our own, our family holidays have always been spent hiding from other small humans. While Centre Parcs’ wild rapids and endless activity schedules tick all the boxes for lots of parents, frankly, its our idea of hell – give us a remote barn or a mountain top lodge any day. As a result, so far, Rosie has spent her summers hiking up volcanoes, trekking through National Parks and devouring croissants in unpronounceable French hamlets. So, when we were invited to test out Finca de Arrieta, a family-friendly eco village in northern Lanzarote, we arrived with trepidation, with visions of hectic communal dining and screaming children. More fool us. Backed by mountains and a short walk from tiny Arrieta and its beach, the luxury retreat is a surprisingly serene tangle of volcanic stone walkways cocooned in blooming bougainvillea, which wind their way through a maze of silk-lined yurts, basalt cottages and luxury villas. Varying in grandeur, they work their way up to the dreamy Eco Yurt Royale; a lavish 4-bed Mongolian yurt, kitted out in ornate Balinese furniture and illuminated by candlelight, complete with a partly retractable roof for stargazing. Not quite ready to succumb to winter glamping, our home from home was The Eco Barn, a lengthy two-bedroom property made from local basalt with a generous private garden and cheeky views towards the Atlantic. Despite being the closest property to the road, the soundtrack to our stay here was that of the towering rustling palms which separated us from the heart of the resort. The resort’s communal area featured an honesty shop, an information hut, a small and rather beautifully designed heated pool and a spacious lounge area, where guests can cook, catch up on emails, entertain the kids or simply enjoy a cuppa and a chat. 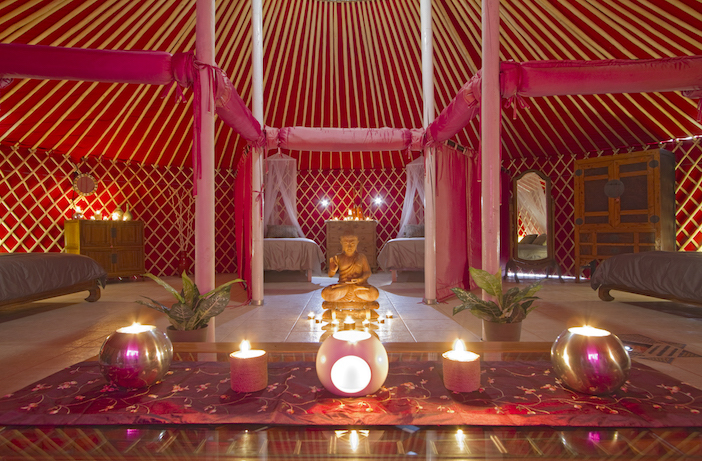 An additional activity yurt set the stage for regular yoga, Pilates and stretch sessions. Whilst all properties benefit from private kitchens, those keen to kick back and relax, have plenty of local restaurants to try out – plus, the finca offers a convenient ‘dish of the day’, which the team will deliver to your door in time for supper. If you fancy mingling, the Finca de Arrieta paella night provides great food and super company – during our stay guests were a mix of sporty types on winter training breaks after a base with a difference, and families seeking out the finca’ s amenities (it has a super playground). Powered by Lanzarote’s plentiful supply of sun and wind, eco credentials run through this ‘off grid’ encampment – chickens, donkeys and ducks await your scraps, solar panels heat the dreamy pool and you can even cook on their outdoor sun-powered hob. Our property came with complimentary use of a hybrid car, so whilst afternoons were reserved for lounging around the peaceful pool on the super-comfy daybeds, we spent our mornings out and about, exploring the north of the island. We discovered lots of towns and villages during our stay, but my favourite was hippy Haria, just a 10-minute drive. Lovingly referred to as The Valley of a Thousand Palms, this lush settlement lays claim to being one of the island’s prettiest towns (and its greenest), thanks to the historic tradition which saw one palm tree planted for every girl born there and two for every boy. I visited several times during my stay, but the quiet streets came to life on Saturday morning, when a free-spirited collective of artists and crafty types take up residence in the shady Plaza León y Castillo. Stalls sell everything from hand-dyed silk scarves and colourful woollen soaps to handmade straw hats and local aloe vera products, and all to the backdrop of live jazz. A handful of busy pavement cafes and bars spill out in to the side streets, tempting you to linger. The island’s famous cactus garden also lured us in more than once. This prickly haven was Manrique’s last gift to the island. 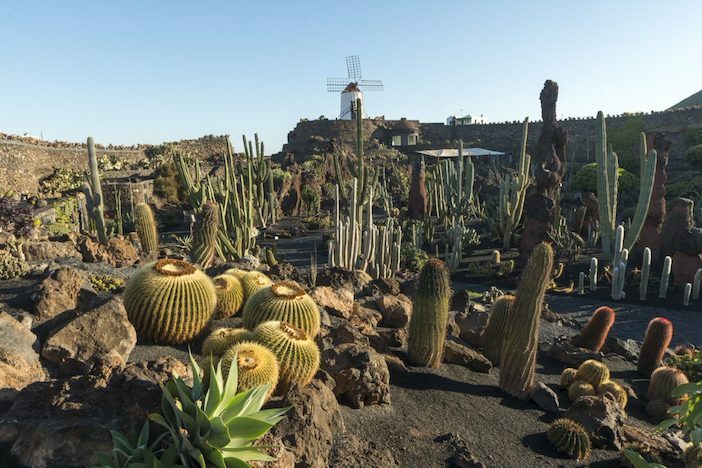 Set within a rundown quarry, this sheltered sun trap in nearby Guatiza, is surrounded by the Lanzarote’s largest cactus plantation and showcases almost 500 different species, with an elevated safari lodge style café from which to admire the views. However, staying true to our reclusive nature, our favourite spot was at the top of the Famara Cliff. 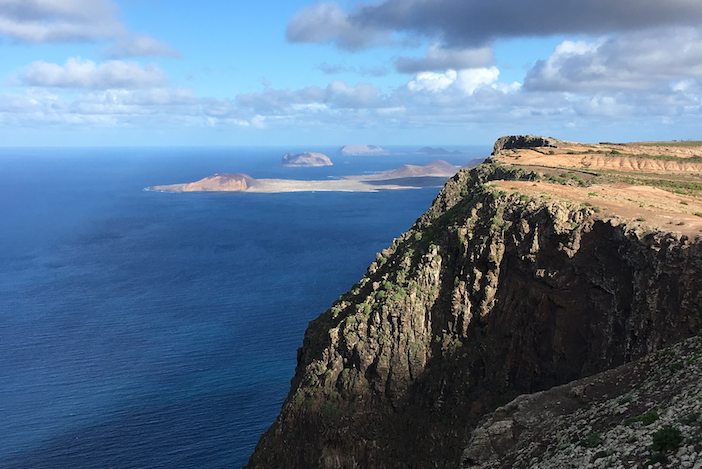 The 23km escarpment climbs its way up to 671 metres, providing spectacular views of golden Famara beach (a Mecca for surfers), La Graciosa and its neighbouring islets, and in some places, even across the other side of the island, back towards Arrieta. Forming part of the Chinijo Archipelago National Park it is utterly serene, aside from the roaring winds. Carpeted in wildflowers and peppered with fragrant wild fennel it’s abundant with wildlife, home to everything from soaring birds of prey to the elusive Canarian shrew. There is a wonderfully remote clifftop playground, some of the island’s most scenic picnic benches and even a handful of communal barbeques waiting to be fired up. Further along the cliffs we also stumbled upon a totally secluded and wonderfully peaceful chapel, Ermita de las Nieves, which translates as Hermitage of Snow. I am not sure what I expected from our first family-friendly eco village experience; a hippy Mongol settlement, run by over-enthusiastic happy campers and noisy children, perhaps. Again, more fool me. Finca de Arrieta proved to be a stylish, peaceful, boutique base from which to enjoy what is, in my opinion, the most beautiful part of this fascinating island. Rosie once again spent much of her holiday hiking up mountains, scaling volcanoes and playing in National Parks. But Finca de Arrieta offered us the flexibility and convenience of friends, toys and entertainment in an instant, should we want it. Our usual 6am ‘shhhh’ session, was replaced by a trip to the giant trampoline, good behaviour at breakfast was rewarded with feeding the leftovers to the animals and after a day with her head in the clouds up yet another mountain, she ran home to tell her friends all about it. So, am I ready for Centre Parcs yet? 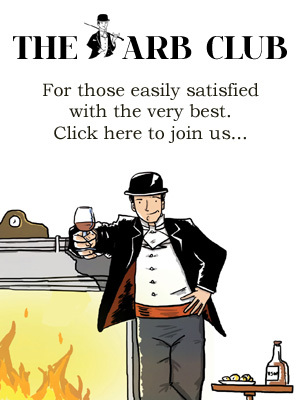 Lord no. Could I handle another week in a silk-lined yurt with meals delivered to my door and friendly faces around the corner? Sí sí. 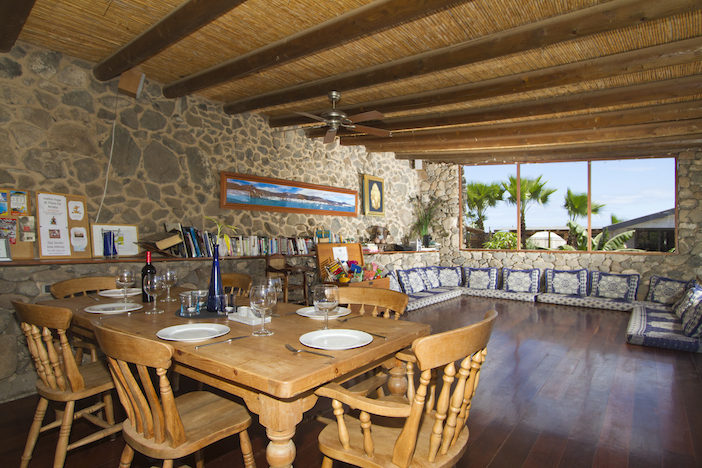 Finca de Arrieta eco village is part of the Lanzarote Retreats portfolio. Prices start from 770€ per week based on 2 guests. For more information or to book, visit www.lanzaroteretreats.com.